Hunch has been around the web for a while now, but there has been a lot of buzz the last several weeks since the Wired article came out about Caterina Fake and her new project. You may know Caterina as one of the key people behind the photo sharing community Flickr, which I happen to love. 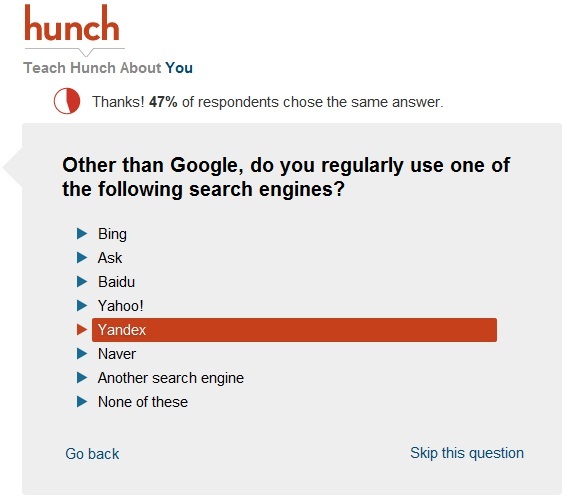 The basis for hunch is that they can take data about preferences, mix with demographic data, then crunch using complex algorithms that allow complex relationships to appear. Based on what their system knows about your tastes, it can make amazingly profound suggestions. I have been playing with their system for a few days now, especially since they have a connection to Facebook and Twitter built in now. It is playful and amusing, but I'll have to work with it over a longer period of time to see how accurate it is in regards to the suggestions that it provides. I also wonder if it will naturally correct for changes in my preferences over a long period of time. Maybe it is the fact that I watched Blade Runner again last night, but the "getting to know me" questions almost felt like a Voight-Kampff test.